Safe Tile™ is a chemical solution designed to increase traction by creating microscopic channels in most hard mineral surfaces, such as; ceramic tile, quarry tile, granite, porcelain, and as well, steel porcelain enamel bathtubs. After the product is applied the water will disperse into the newly created microscopic channels and this will create an anti-slip surface. WearMax™ is a space age, next generation waterborne, low VOC, clear anti-slip protective coating system which provides a tough hard wearing and long lasting non slip surface. It cures to provide a surface which is tough, abrasion resistant, and has superior wear resistance, superior scratch resistance and excellent slip resistance as well as low maintenance and very good chemical and stain resistance. Safe Grip™ is an industry unique cold vulcanization process which creates sustainable, very hard wearing anti slip surfaces. It is a very fast drying and curing state of the art highly non slip product with outstanding adhesion and wear resistance. Safe Grip™ has outstanding durability as well as it is heat, water, electric current, saltwater, UV, impact and chemical resistant. Floor Tuff Ultimate™ is the latest state of the art water based environmentally friendly polyurethane anti slip protective coating which provides an exceptionally tough hard wearing and long lasting non slip surface. MULTI KLEEN™ is an extra heavy duty water soluble, Environmentally Green, Anti-Bacterial, Multi–Purpose Cleaner designed to remove heavy soils and greases in a wide range of hard surface cleaning applications. Effectively removes baked on carbon, oils, exhaust deposits and many other types of soils associated with industrial/commercial cleaning. Multi Kleen is designed to clean all anti-slip surfaces. These proven, outstanding and local slip resistance standard compliant solutions are backed up with our industry unique risk management program called the Surface Safety Maintenance Program©. The SSMP© will provide the client with ongoing assistance of the anti slip treated surfaces and offered at No Additional Cost, as part of the solution. Tile Safe Products will be responsible for distribution, training and application as well as offering regional and local distribution business opportunities for interested parties in the North American region. For further information about a solution for your Slippery floors and how Tile Safe Products can assist your company with any OH&S compliant floor and other surface safety solutions in North America. GLOBAL SAFE TECHNOLOGIES VICTORIA WILL EXHIBIT AT SAFETY IN ACTION IN MELBOURNE AT STAND B48. The show will be held at the Melbourne Exhibition Centre between 31 March and 2 April 2009. SAFETY IN ACTION is Australia�s premier Workplace Health & Safety Trade event for your business. As Melbourne's premier safety event, Safety In Action (SIA) will include over 350 exhibitors and attract in excess of 11,000 visitors over 3 days at the Melbourne Exhibition Centre. Global Safe Technologies Victoria will exhibit its entire �one stop floor safety shop� solutions range which includes floor and other surface safety solutions for virtually any surfaces and situations. They will also exhibit their full range AS 1428.1 compliant tactile and stair nosing solutions. The exhibition will provide an insight to the latest safety solutions and services and for the first time in 2009 architects, facility managers, specifiers, security consultants and building managers will also benefit with the new Fire & Security Feature, showcasing instalation systems, fire and emergency training and fire retardant garments. Other features at this years Show include Corporate Health, Building & Height Safety, Training & Technology and Electrical Safety. Registrations are now being taken. Entry is free, , register online today. Safety In Action truly is the country's leading OH&S event with the co-located events; Melbourne Materials Handling Trade Show and theCarbon Reduction & Trading Expo. To register to the Safety in Action please click on Register. GLOBAL SAFE TECHNOLOGIES NSW AND GLOBAL SAFE TECHNOLOGIES AUSTRALIA WILL JOINTLY EXHIBIT AT THE SAFETY SHOW SYDNEY AT STAND M22. The show will be held at the Sydney Showground, Sydney Olympic Park, 28 - 30 October 2008. Supported by Principal Sponsor, WorkCover (NSW), THE SAFETY SHOW, SYDNEY is NSW's only dedicated Workplace Health and Safety Trade Show. 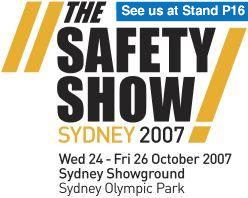 The 2007 Show, held at Sydney Showground, attracted over 10,000 health and safety professionals from a broad range of industry sectors, including manufacturing, building/construction, government, emergency services, transport/freight and many more. Key industry manufacturers, wholesalers and suppliers exhibited the latest in workplace health, safety and manual handling solutions over the 3 days. Safety in Action in Melbourne at Stand B43. The show will be held at the Melbourne Exhibition Centre between 29 April and 1 May 2008. SAFETY IN ACTION is Australia�s premier Workplace Health & Safety Trade Show, held annually in Melbourne. The SAFETY IN ACTION Trade Show features more than 350 companies displaying the largest range of Workplace Health & Safety products and services. Co-located with SAFETY IN ACTION is the MELBOURNE MATERIALS HANDLING Trade Show featuring materials & manual handling products and services. Also held concurrently is the Safety in Action Conference with over 70 Australian & international speakers covering the latest issues in OHS. For the first time the AUSTRALIAN CARBON TRADING EXPO will also be co-located at the Melbourne Exhibition Centre from 29 April - 1 May 2008. Global Safe Technologies Australia will jointly exhibit with Australasian Slip Testing at Full Frontal Tile & Stone Expo in Sydney at Stan A12. The show will be held at the Sydney Showground between 17 April and 19 April 2008. Full Frontal will present the Tile and Stone event, featuring exciting displays, comprehensive seminars, new products and technologies, a radical buyer's guide that will be an invaluable resource for every visitor and exhibitor. Plus a new and revolutionary 'product link' that will connect exhibitors and visitors post show. 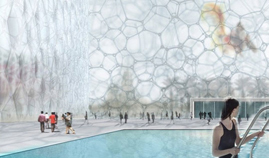 We will consistently release news about exciting interactive exhibits, an architects reception, a keynote breakfast, our Full Frontal project awards and amazing rewards for award winners. To register to the Full Frontal Tile and Stone Exhibition please click on Register. Global Safe Technologies Australia will be exhibiting at Australia�s premier safety show, the Safety Show Sydney 2007 at Stand P16. The Safety Show is NSW's only dedicated Workplace Health and Safety Trade Show. Each year the event attracts over 10,000 health and safety professionals from a broad range of industry sectors, including manufacturing, building/construction, government, emergency services, transport/freight and many more. Visitors can register online to visit for free. Click here to register. Global Safe Technologies Victoria will be exhibiting the full range of surface safety / anti slip products and services, which allows us to treat virtually all types of surfaces and make them OH&S and AS/NZS slip resistance standard compliant. Having not only an outstanding product range, but also being part of the world�s largest floor safety network and offering a free risk management program also gives confidence to our very large international customer base. For further information on the Global Safe Technologies Australia�s non slip solutions range of products call us on 1300 668 620 or visit our website www.globalsafe.com.au. If you have any specific concern about your floor surface and would like to contact an Authorised Dealer in your area visit http://www.globalsafe.com.au/contactus.php. An Authorised Dealer will come out and will provide you with a risk assessment of your specific situation and will provide you with a complimentary FREE Floor Safety Inspection Report. "Global Safe Technologies Australia is welcoming the latest member of the Global Floor Safety Network, Mr. Qingpo Niu from Bejing. Mr Niu has secured the Master Distributorship rights for entire China and Hong Kong region. Global Safe Technologies is also very pleased to announce that its Safe Solution� micro etching anti slip treatment has been recognised by Chinese Authorities as an outstanding quality non slip product to treat most tiled surfaces. It is also great to mention that this development will allow the people of Republic and China and Hong Kong to enjoy the same OH&S and floor safety benefits what several other countries currently enjoy. The importance of our industry unique risk management program, the Floor Safety Maintenance Program� was also recognised as a very important tool preventing slip fall accidents." Global Safe Technologies is proud to announce that its outstanding product range now includes the next generation water based environmentally friendly version of the Floor Tuff polyurethane coating, called, Floor Tuff Green. This product has been built on the outstanding qualities of Floor Tuff, but has major improvements. It now offers much higher slip resistance Class V / BPN 58 and independent accelerated aged wear testing showed that the product after 8 years is still has a Class W / BPN45 slip resistance. The product curing time has also dramatically been reduced, requiring minimum or no downtime for prospective client�s business operation. Due to technological advances and cost efficiencies, the application cost of the product has also been reduced. This is an absolute win for clients as now they can have an environmentally friendly, far more slip resistant non slip floor surfacing product installed with minimum or no downtime at a lower cost. For further information about the product visit Polyurethane Anti Slip Coating Solution. For international distribution opportunities please visit International Authorised Master Distributorship Business Opportunity. Global Safe Technologies Victoria will be exhibiting at Stand E10 of Infrastructure Australia 2007 Expo which will be held from 6th of September to 8th of September at the Melbourne Exhibition centre. Infrastructure Australia 2007 is a leading international trade exhibition on product and services for Commercial, Industrial and Major Projects. Global Safe Technologies Queensland Dealers will be exhibiting at booth G28 at the Queensland Safety Show, starting 19th of June at the Brisbane Convention and Exhibition Centre. We are looking forward seeing you there as there will be lots of new interesting products and demonstrations to cater for your surface safety requirements. Global Safe Technologies Australia is welcoming the latest member of the Global Floor Safety Network, Global Safe Technologies Philippines, which company joined to the group to help the cause of slip fall prevention. The company also has a new website www.globalsafe.com.ph, some of which is still currently under construction, but expected to be fully functional in the near future. This is the next step to the Global Safe Technologies group international expansion in the world's largest market, Asia. For further information regarding to the news release please contact Tibor Bode on 02 9729 4479. Global Safe Technologies is proud to announce that its outstanding product range now includes the Safe Grip cold vulcanisation anti slip stripes and non slip coating. The product after several years of very successful applications in Australia and Europe now is in he process of being patented. For further information about the product visit Anti Slip Strips and Non Skid Treatment Solution. For international distribution opportunities please fill out the enquiry form. Global Safe Technologies is proud to announce that as part of its ongoing commitment to the slip fall prevention cause, it is sponsoring the Australian Falls Prevention Conference 2006 to be held at Sofitel Brisbane from 5th to 7th November 2006. Global Safe Technologies Australia is proud to announce that it has extended its non-slip / anti-slip product range with Dry Treat�s Stain Proof� penetrating sealer and Enhance Plus� products. The company and its Authorised Dealers have also become Accredited Applicators for these products in Australia. This accreditation will follow soon in other countries where Global Safe Technologies is present. We are looking forward providing even better service to our clients. Dry Treat is an Australian owned company whose clientele spreads across five continents. Global Safe Technologies has recently attended several trade shows in Adelaide, Melbourne and Brisbane. The response to our Floor Safety Maintenance Program� as a total solution for not only providing non slip / anti slip surface, but also maintaining and monitoring it, was huge. Clients have also welcomed our newly developed CD package which had a very high take-up rate. Global Safe Technologies Australia would like to announce that it has included the SlipAlert for all its Authorised Dealers as an indicative slip resistance testing device. Global Safe Technologies Inc. also announced "The *SlipAlert people and Global Safe are in the final agreement stages to make Global Safe the exclusive distributor of SlipAlert for Canada. Once finalized, SlipAlert will be added to our product line up for worldwide distribution to our Global Safe distribution team"
For further enquiries or International Distributor and Authorised Dealer Business Opportunities please phone Simon Cudmore on +617 3848 9454 or send an email. Global Safe Technologies Australia has joined HIA. Global Safe Technologies is proud to announce that it will be exhibiting at the Sydney Safety Show 26 October to 28 October 2005 at Stand N51. The company will also will also be announcing several new products during the show.. Global Safe Technologies is proud to announce that it has joined to Spec-Net, the No 1 search engine to the Building Industry in Australia. This will ensure that the company will be able to service better its clients and to provide a greater recognition to its anti-slip products and services. We are pleased to announce that Global Safe Technologies Australia will be exhibiting at this year’s Designbuild Australia, the 19th International Building & Design Expo. Our booth is W11. The show dates are June 5 – 8, 2005. We hope to see you at the show. We are very pleased to announce that Global Safe Technologies Australia, an associate member of the Global Safe Technologies Group, has just entered into an agreement as an approved contractor with one of the largest restaurant chains in the world. President Global Safe Technologies Inc.